PEPEʻEKEO, Hawaiʻi - A group of community fishermen is requesting a contested case hearing as the bioenergy facility applies for a discharge permits. 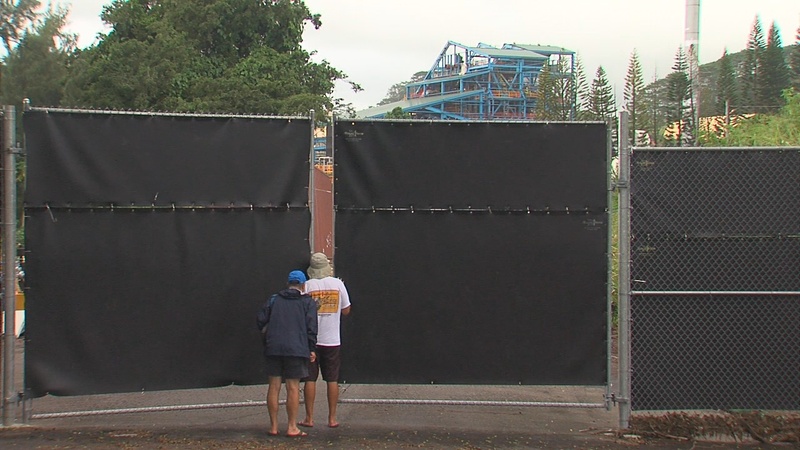 People peek between the fence for a look at the Hū Honua facility under construction in Pepeʻekeo. (BIVN) – Members of the Pepeʻekeo community are asking for a contested case hearing, as preparations at the Hū Honua Bioenergy facility near completion. Jaerick Medeiros-Garcia of the Pepeʻekeo Shoreline Fishing Committee says they have made a request in writing and plan to follow it up with a verbal request at an upcoming hearing in Hilo. Hū Honua is engaged in a National Pollutant Discharge Elimination System Application. The bioenergy company is seeking a permit to discharge storm water associated with industrial activities into state waters subject to special conditions. The bioenergy company is also applying for an Underground Injection Control Permit, as well as a Solid Waste Permit for the recycling of ash. The State Department of Health will hold a public information meeting and public hearing on these applications in Hilo on Wednesday, November 14th at ʻImiloa Astronomy Center. The meeting begins at 10:00 a.m. The local chapter of the Sierra Club is also requesting a contested case hearing. Other environmental and community groups are said to be lining up to request a hearing, as well.